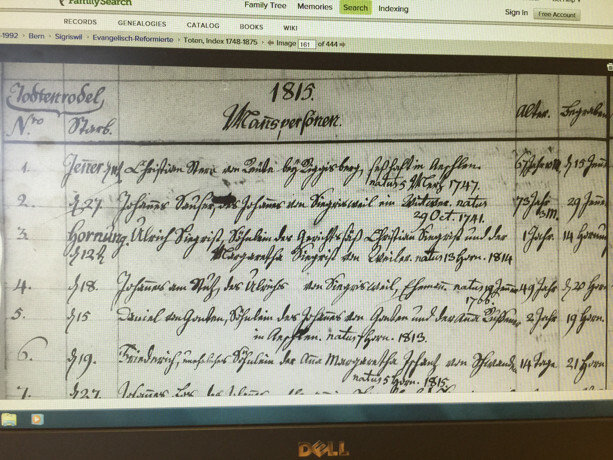 I recently discovered the Swiss Church / Kirchenbücher book collections, and though you can locate them on FamilySearch, you have to view them in a LDS Family History center or library. This creates some additional constraints to me reading and going through them (see below). For context, the specific church books I am wanting to view are listed on the state archives webpage of the canton of Bern as well as in this breakdown of them. This document (in German) also has some examples of what the books themselves look like, and look like they would be some effort to go through. I also know I can order scans of each of the book sets by community on CD, but they are several hundred dollars per CD from Pikton Press, and I lack commercial grade OCR software that I think could both read the hand writing and the German. Luckily there has been at least one hand written index of them, but I am having a hard time reading them at the library as they do not line up to the reference documents on Family Search. I am hoping to still extract some value by looking for dates and names, but am not following the format completely of the middle column specifically. I know they are organized in chronological (date) order. (Note I do not speak German either and each images can take well over a minute to load at my local FHL). I have been unable to find any typed version of these indexes. My specific question is: what are the column headers AND what is the date that doesn't have a column header but seems to be consistently present under most records? As a bonus if there is anything else that seems consistent about the records I would appreciate knowing that as well. This particular example is from a Toten or Burial record index. There are Toten (Burial), Taufen (Baptismal), and Verkündungs (Pronouncement/Proclamations???) Indexes. Link to Family Search Burial Template as an example from one of their guides for the above example record which doesn't align. First column: “Todtenrodel”, means list of dead persons, so these are no birth/baptism records but death records. They consist of a column with a running number and a second column titled „starb“ (died, date of death here). Next column: “Mannspersonen”, synonyme for (male) human being, contains name and often relationship (son of ..., often both parents are named) and birth date (natus, Latin for born). It's the date you were asking for. Next: “Alter” (age) and “begraben” (buried, date of burial). The second column uses old-fashioned names for months, like Hornung instead of Februar (february). A list of these old names can be found in the article Monat in GenWiki (first table). I think you need only a limited German vocabulary to understand these records. Maybe 50 to 100 words, most word lists (like this one from FamilySearch) contain more words than you will ever need. Concerning the old script: An average German had similar problems like you. The hardest part - for me as well - are the surnames. The rest is much easier. The book on German handwriting from Roger P. Minert should serve you well. See also my answer at German.SE: Is there a service to help transcribe Kurrentschrift into Latin script? Not the answer you're looking for? 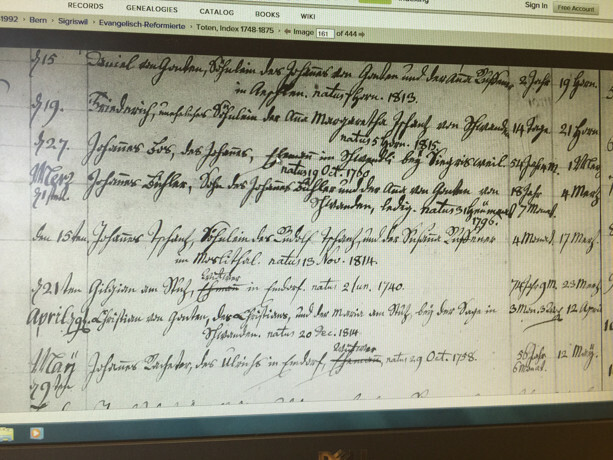 Browse other questions tagged palaeography switzerland or ask your own question. Reading entry from Quarter Sessions Order Book of Dorset, England 1682-1693? Reading 1625 burial record from East Quantoxhead, Somerset, England?